Those 4 frightful days at Inter IIT Kanpur 2009-10 and how they changed our lives forever! The first group game pitting IITM vs IITK saw a series of egregious decisions by the referees to turn a deserved and comfortable win for us snatched away. We were leading 4-2 with 5 minutes on the clock, and we left the field high and dry, bristling with anger as the scoreline had been reversed to 4-5. We had another group match against Kharagpur in the evening, where a loss would have seen us catch the early train home. We decided to channelize our anger and take it one match at a time; we dropped out of all swimming events which were scheduled for the evening and concentrated on the match against KGP. I and S R S Ravi Teja (1B) had assured medals in the events which were due but it was not about individuals any longer. A flood of emotion swept through our contingent. This decision worked incredibly well and we decimated KGP 13 – 6. Ishaan Soni (Hoby) and Nichoda (Abhijat Joshi) did a wonderful job in defence while Sahaj (Gujju), Prabhat Kiran and Tokas (Abhinav Gopal) kept Kharagpur players busy swimming up and down throughout the match as One-B, Kaushal K. N. (Chutta) and I took care of the scoring. We felt refreshed and invigorated. IIT M had arrived. Next day we had a series of swimming matches and we strived to make up for the events we lost on day 1 as medals started pouring in. Given the fact that we had no Waterpolo match that day we concentrated on increasing our swimming medal tally and we achieved it. One-B bagged the 100 m silver. I won the 100m butterfly silver. We added to the silver tally with another fine display in 4 X 100 mts Men Freestyle Relay. We were content at the end of day two and went to a dinner organized by parents of one our female teammate Pachak, whose Dad was a faculty member at IIT Kanpur and their house was inside the beautiful campus itself. It was Tokas who was the first victim of a severe stomach ache as we made our way along the surreal roads to dinner, and one by one most of us started feeling dizzy and uncomfortable. None of us could eat anything and we went back to our hostel exhausted due to a tiring day and no food. I remember vividly, it was around 11 in the night when Tokas was rushed to the hospital as his condition had turned alarming. One by one 4 of us namely Nichoda, Prabhat, Chutta and I had to be admitted with acute vomiting, nausea and stomach ache due to food poisoning. Nearly 40 people were sharing our plight, apparently the stall which was serving food right outside the swimming pool during the meet had sold spoiled items. All 5 of us were on glucose drips the entire night with frequent injections, by the time we could open our eyes the next morning it was 11 am and most of the morning swimming events didn’t witness participation from the IIT Madras contingent. Both Chutta and I were in the same hospital room (We were the captains of the Waterpolo and Swimming teams respectively) and though we were very weak the only conversation we had in the ward was how we would show our face in Insti without contributing to the IIT Madras GC quest. We were down in the dumps at the turn of events. 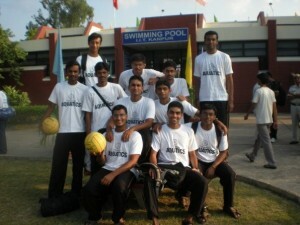 We were part of an illustrious pantheon of IIT Madras swimmers and no point in Inter IIT would be a colossal disgrace. It was around then that we decided to let go of swimming as individually neither of us were in a shape to compete however we couldn’t dream of leaving water polo as we could collectively defeat our opponents yet. The onus was on us. Our Director Dr. Ananth and Sports Advisor Dr. Kamraj told me over the phone to book flight tickets for all the affected team members and return, however they were very supportive when we conveyed our wish to stay back and try for Gold in Waterpolo. They left the final decision to us! The decision to stay back and compete was an emotional one, reality dawned upon us soon – Our semi-final bout against IIT Bombay was scheduled for around 4 PM with 5 of the main 7 team members occupying the hospital ward and the remaining 2 (One-B and Gujju) down with fever. We took the drastic step – both Chutta and I contacted the hospital staff and requested to be discharged. The staff were aghast. They advised us against leaving and told us that the only way we could do so was by signing a document completely freeing the hospital of any consequences of the decision and we wouldn’t be admitted again. Well, we left anyways. Then we went one by one to the remaining 3 who were admitted to discuss with them about their condition and if they would like to play. It didn’t take a second for Nichoda to come on-board; he jumped right out of his bed. Prabhat thought for a while before agreeing as he was extremely weak and Tokas reluctantly didn’t join as he was the worst affected and because his parents had arrived by then to help him, who of course, dismissed the suggestion. Hospital at least had the courtesy to drop us in an ambulance till the swimming pool, 4 of us marched out. We still had our IV’s on though we were unsure till the last moment about our ability to play. I scurried back to the hostel to gather the rest of the team fully aware that their morale would be rock bottom; I don’t remember the words exactly, but 15 minutes of inspiring talk full of IIT M’s waterpolo legacy mixed with tears and all of us were on our way to the pool, rejuvenated. We took our IV’s out right before the match and entered the pool to face IIT Bombay which somehow had no one suffering from food poisoning (the other team which was intact was IIT Kanpur, but hey! no conspiracy theory, may be they were just sheer lucky!). Every minute of the first two quarters is etched in my memories (but not going into the details, which can make up a completely different article). In short, we charged at IIT B, much like mad bulls, they were the unlucky recipients of our pent up frustration, at the end of first quarter we were up 5 – 0. People outside were gaping in disbelief, and at the same time raucously supporting us. All teams joined in to cheer for us, including our arch rivals Kanpur (Indeed, sports do bring people together!). We were ecstatic. Right before the 2nd quarter began we knew we were in trouble, our bodies started giving way though the spirit was intact. We somehow managed to stay in the game though, with the half time at 7 – 1. Prabhat had to be pulled out of the pool. Inexperienced Naveen Thomas (Graffiti) replaced him and did a wonderful job, keeping Bombay’s main forward at bay. We tottered out at half time as we couldn’t swim anymore. The only thing which kept us going then was the moral support we were receiving from our fellow teammates – Prudhvi (Kundi), Rudra Naik (GPS), Pranshu, Shruti, Pachak etc. We knew that the next two quarters would hinge on our tenacity as we were too exhausted to go out and attack. The next two quarters are blurred, we were barely floating. I remember Nichoda making some stupendous saves as Goal Keeper, I remember Bombay being very aggressive and the ball in our half most of the time, our back pressed against the wall. We couldn’t even muster enough energy to swim to the opponents’ end. All our skills were put to test and when the final whistle blew, we were glad that we survived and more importantly we edged them out 7 – 5. It took all the remaining energy in us to come out of the pool. We couldn’t think anymore and as the hospital wouldn’t admit us, all 5 of us went back to my uncle’s place in Kanpur and stayed overnight where our condition worsened and we had to unwillingly take the flight to Chennai the next day missing the final match. We somehow reached Chennai and were admitted without delay in the Insti Hospital where we stayed for around 4 days. We gained consciousness to hear that in the absence of 5 main players (out of 7), extras teamed up for the Waterpolo finals against IIT Kanpur, valiantly going down 8 – 5. We had to settle for the Silver. My chagrin at not playing in my final Inter IIT game or witnessing our indomitable quest for glory remains. As I look back, I remember trying to do everything at Insti from being a volunteer to a secretary, a coordinator at Shaastra and Saarang, a few stints at Entrepreneurship etc. but those 4 electric days at IIT Kanpur gave a new meaning to my journey at IIT Madras. A life is governed by the memories one creates and the need for these arises when you feel low at a later stage in your career. It is then that these reassure you of your true potential. I was a part of our Gold winning squad in 2005, 2007, and 2008 but I still feel most proud of the silver at Kanpur and being a member of the plucky 2009 team. 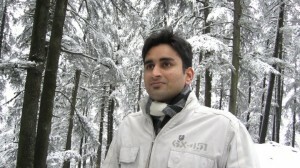 Varun Gupta a.k.a Tattu (DD/BT/2010) was the Insti sports secretary 2008/09. Apart from being one of the best insti swimmers he is also a very successful entrepreneur and was inducted in the “Asia Pacific Future 100 Young Entrepreneurs.” Currently, Tattu runs the data analytics firm Decision Point Pvt Ltd.